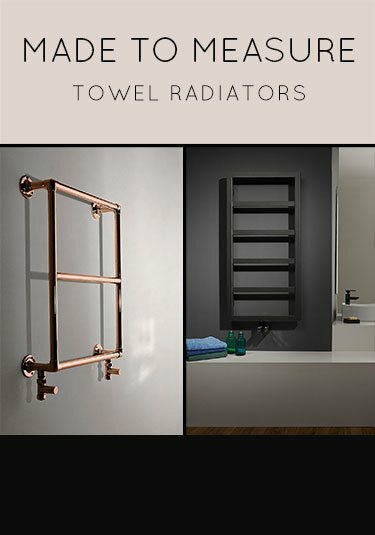 Livinghouse offer a superb collection of gold heated towel rails, towel warmers and luxury towel radiators. Our gold bathroom radiators are made of solid brass tubing with a thick real gold plating which offers superb quality of finish and extra long life over steel versions and imported models. Our gold radiators are handmade in Britain producing luxury quality in traditional, contemporary and the latest designer styles. 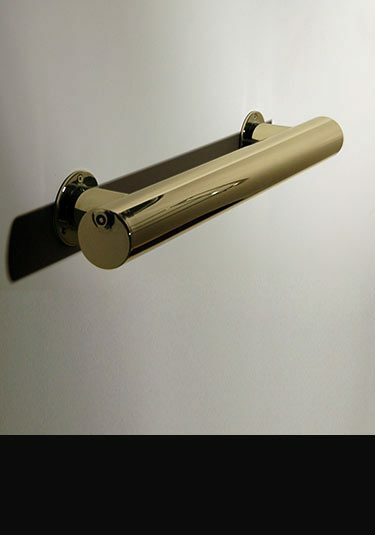 We can supply gold bathroom radiators in floor mounted, wall mounted and freestanding designs, for central heating, dual fuel and electric only systems. Please note all gold plated bathroom radiators are made to special order please allow 3 weeks for delivery. 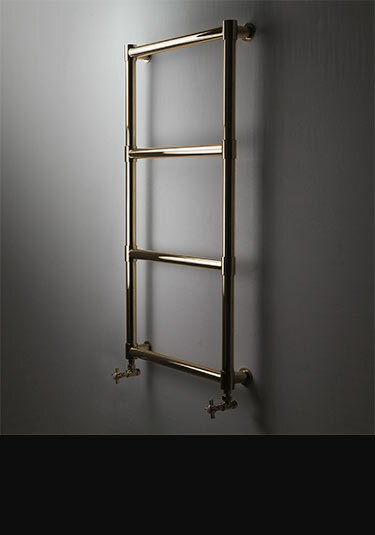 A modern gold heated towel rail with thick square bars. This cubic-style gold bathroom radiator is available in polished or brushed gold finish. 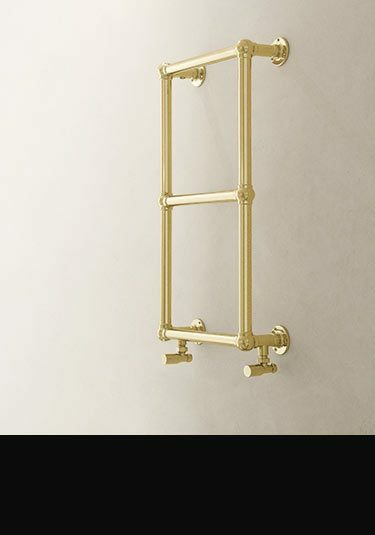 This modern gold towel rail has large bars and chunky joints for a sturdy appearance. Made in Europe to the highest quality standards. Available for central heating, dual fuel and electric only systems. 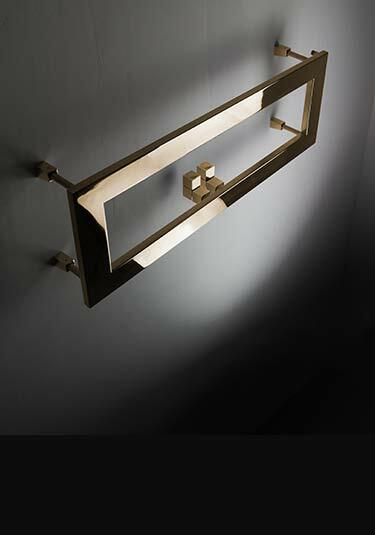 This modern wall mounted towel rail is available a brushed or polished gold. A stylish design with sleek mitred joints. 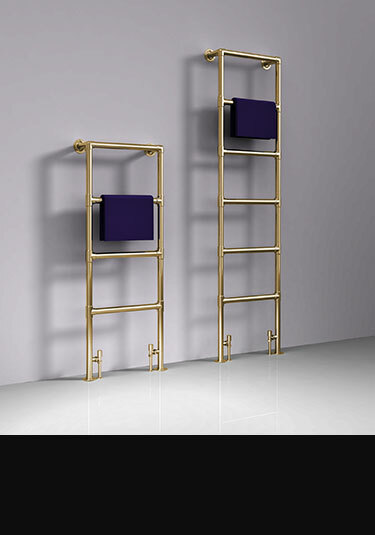 Modern heated towel rail design in high quality gold finish. 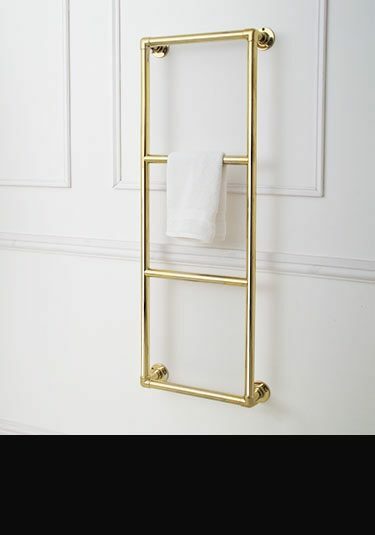 This gold towel rail has large bars for easy hanging of towels. 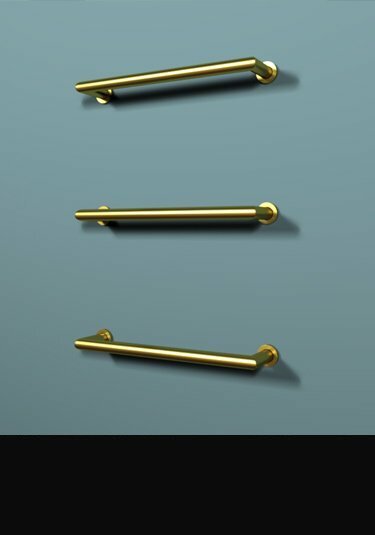 A rectangular wall mounted towel rail is brushed or polished gold finish. A sleek design feature in modern bathrooms. 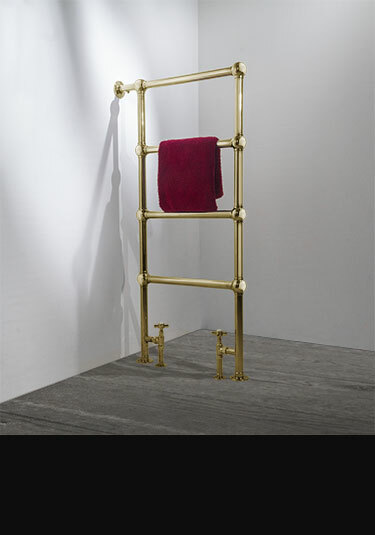 Luxury gold plated towel rail with ball joints. Unique freestanding towel warmer designed to stand perpendicular to the wall. 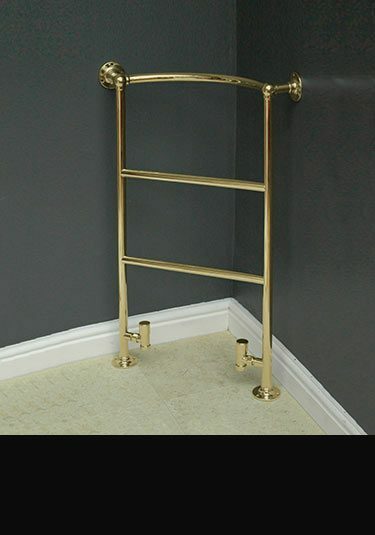 This gold towel rail is made in the UK using the traditional methods. Modern brushed gold towel rail exclusively designed and made in Britain. High quality gold plated stainless steel body. 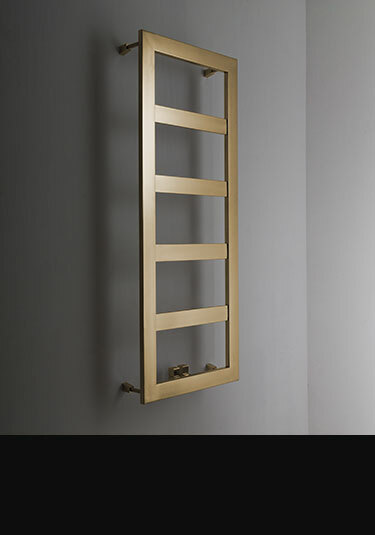 Each brushed gold bathroom radiator has nicely spaced bars for useful towel hanging space. Available in 7 radiator dimensions and supplied for all types of heating systems. 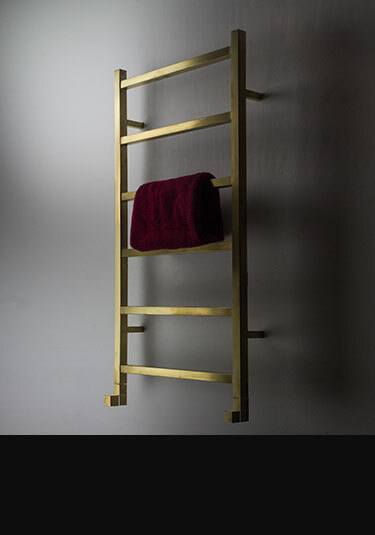 This modern gold towel rail is available in three sizes. Suitable for central heating installation, with 50mm pipe centres. 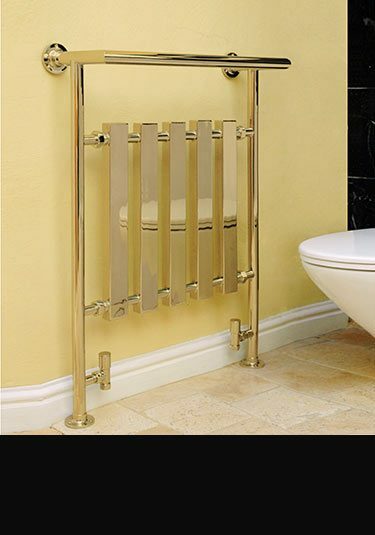 This simple heated hot tube bathroom radiator is supplied in a gold plated finish. This heated towel bar is a lovely British design feature for contemporary bathrooms. Each gold towel warmer can be supplied for central heating or electric systems in various tube lengths. 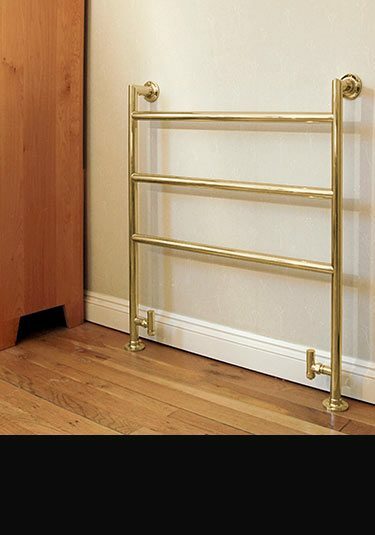 A British made gold plated corner towel rail for wall mounting. Each gold towel heater is available for central heating, dual fuel and electric only systems. This wall hung bathroom radiator with its corner mounting is an ideal space saver in smaller and difficult shaped bathrooms. A luxury corner radiator with a gold finish onto superior brass tubing. 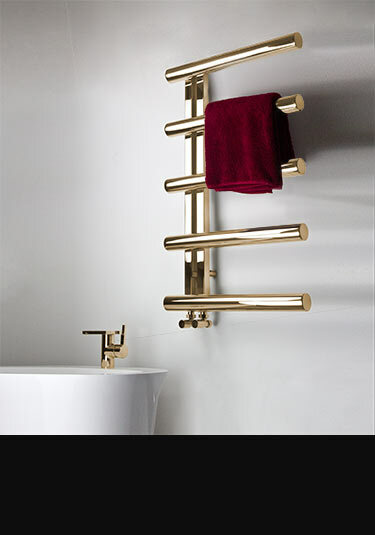 This gold plated towel radiators in an exclusive design of Livinghouse and is unique with its floating towel bars which are heated via an in-wall manifold. Based on a traditional British design, this heated gold towel rail will easily fit into a traditional and classically contemporary interior. 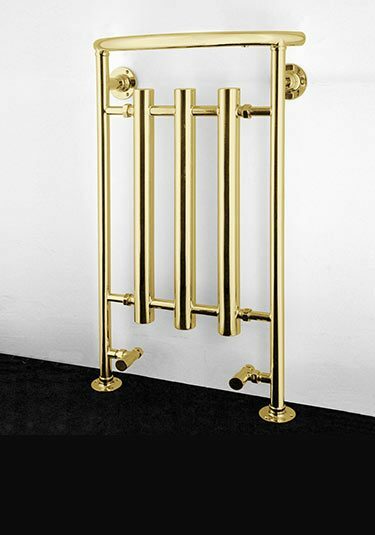 Made in Britain in solid brass with a gold plated finish, this towel bathroom radiator can be supplied for central heating, dual fuel & electric only systems. This stylish gold heated towel rail has well-spaced bars for easy hanging of towels. Made in Britain, these high quality towel rails are ideal for modern bathrooms. 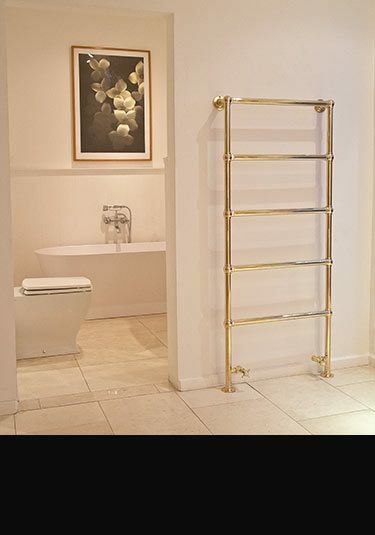 This traditional gold plated heated towel rail has a central white column radiator. Based on an old Victorian towel rail design and made in solid brass tubing with a thick gold plated finish. This traditional gold bathroom radiator is luxury quality and made in Britain. A stylish ball jointed towel rail designed in a authentic traditional style. Suitable for central heating, dual fuel & electrical systems. Made in Britain in solid brass this luxury bathroom radiator is supplied in a gold plated finishes. 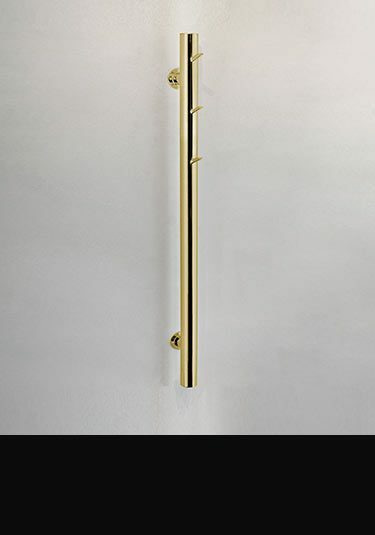 This contemporary gold towel rail is an exclusive design. 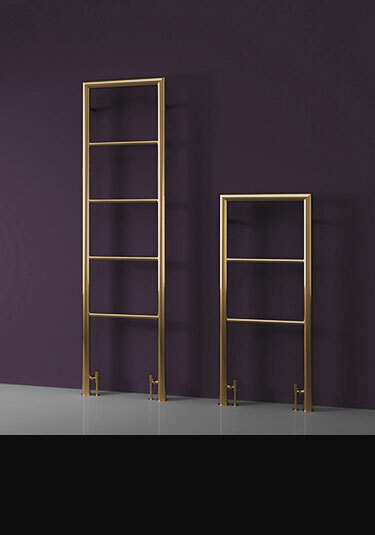 A floor standing ladder style radiator, the Milli Gold Heated Towel Rail is ideal for modern bathroom designs. 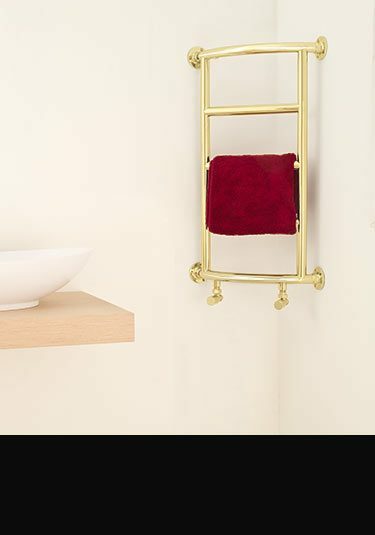 Stylish gold wall mounted towel rail with handy top rack for storage of towels. 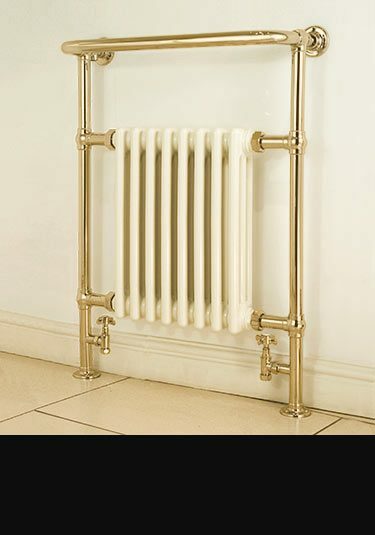 Exclusive gold radiator design made in Britain. Smart and stylish this gold plated on a solid brass multi-rail towel radiator is classically contemporary styled, making it suitable for both modern and more traditional bathroom design. Ideal addition for designer and luxury led bathing areas this towel warmer is available in three sizes for electric, dual fuel and central heating systems. This towel warmer is a unique designer radiator that has be designed in the UK and is British manufactured. Based on the hat stand this bathroom radiator is a stylish way of hanging and warming towels. 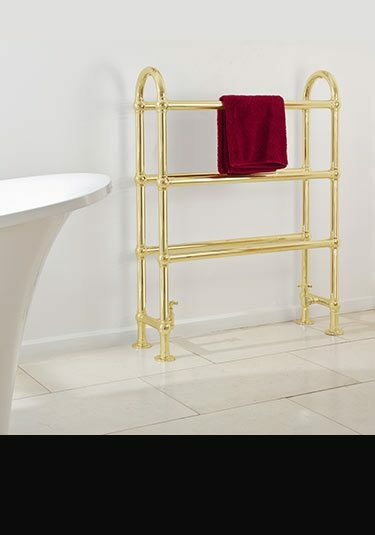 A traditional British heated towel rail available in a gold plated finish. 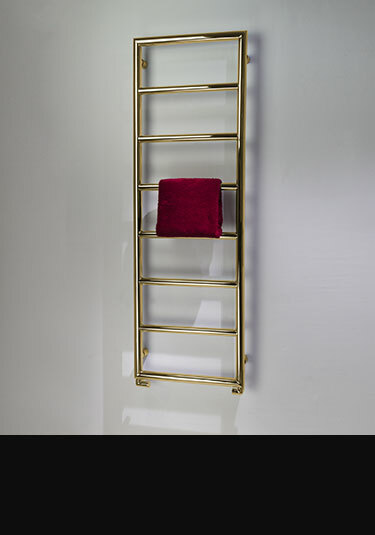 This high quality gold towel warmer has well spaced hanging rails for the easy hanging of towels. Made in Britain in many 8 sizes with bespoke sizes available. This exclusive gold heated towel rail is a high quality bathroom radiator made in Britain exclusively for Livinghouse. With traditional joints, this towel rail is great look for both classic and modern bathrooms. 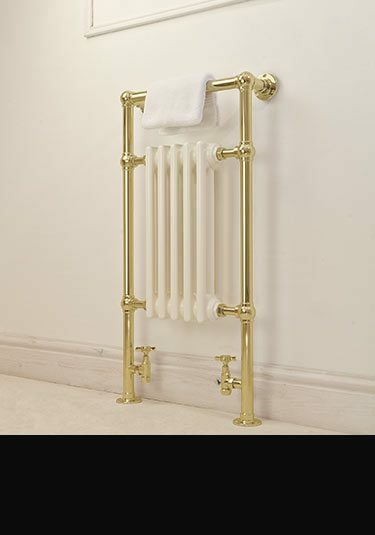 Made in Britain traditional gold towel warmer styled on an old Victorian design. Available for central, dual fuel and electric systems with each gold plated towel radiator is handmade and luxury quality. A British manufactured traditional towel rail to an old ageless British design. Available for central heating, dual fuel and electric only systems, this towel bathroom radiator can also be supplied in chrome, nickel and gold plated finishes all onto solid brass. Lovely quality. 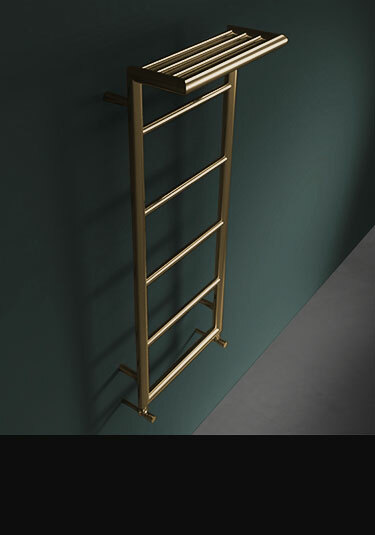 A luxury towel radiator that is made in Britain in superior brass tubing and a gold plated finish. 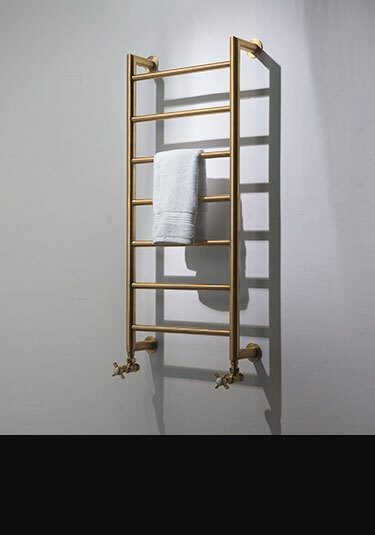 This traditional gold towel hanging radiator has wide spaced hanging bars for easy towel warming. Supplied for central heating, dual fuel and electric only systems. With its exclusive hat stand styling, this designer gold towel radiator is a stylish design feature to contemporary and luxury bathrooms. Designed and made in Britain. 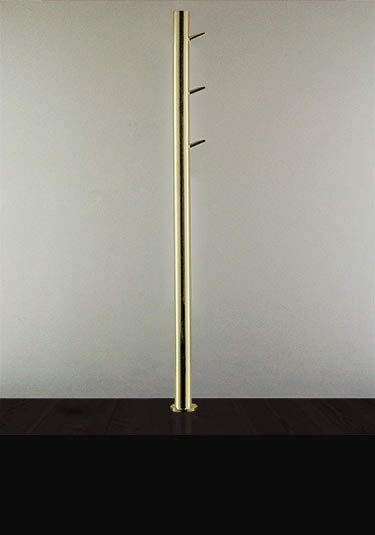 This tall heated towel rail is luxury British manufactured in solid brass with a gold plated finish. This traditional bathroom radiator can be supplied for central heating, dual fuel and electric systems. Its simple styling is also an ideal design choice for contemporary bathrooms. A traditional gold bathroom radiators based on an old original Victorian design. 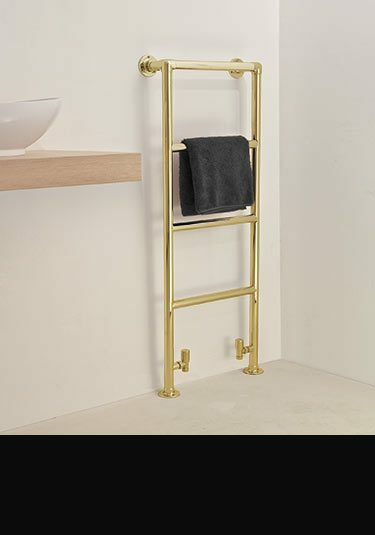 This luxury gold plated towel rail is made in Britain in solid brass for using with central heating, dual fuel and electric only systems. 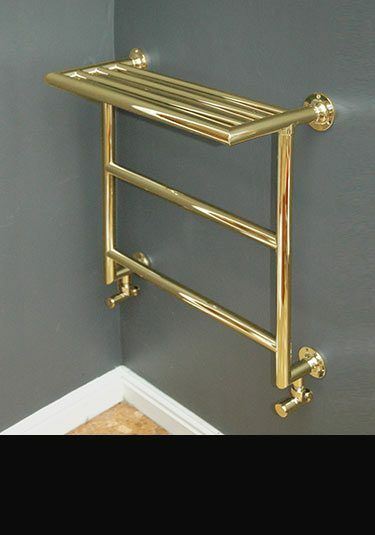 A traditional ball jointed towel rail made in Britain in solid brass with a thick gold plated finishes. 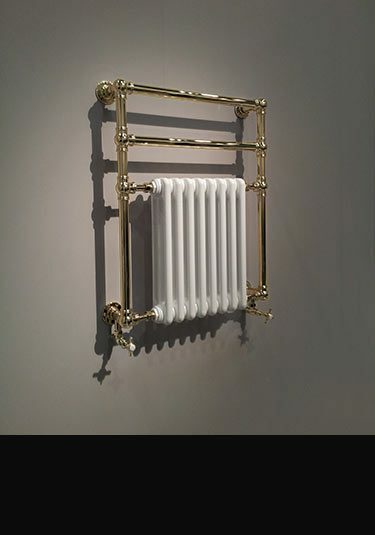 This luxury gold bathroom radiator is based on an old original radiator and is suitable for central heating, dual fuel and electric only systems. This wall mounted towel rail has a handy top rack storage and heated towel hanging bars. Each towel radiator can be supplied in chrome, gold and nickel finishes, all onto solid brass tubing. Manufactured in Britain ensuring high quality with bespoke towel rails also available to special order. 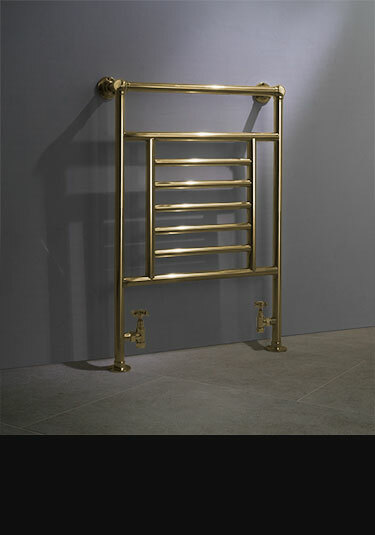 Traditional British made towel warmer that in made of superior brass with a gold plated finishes. This gold Victorian styled towel heater gives lots of towel hanging space and good heat outputs. 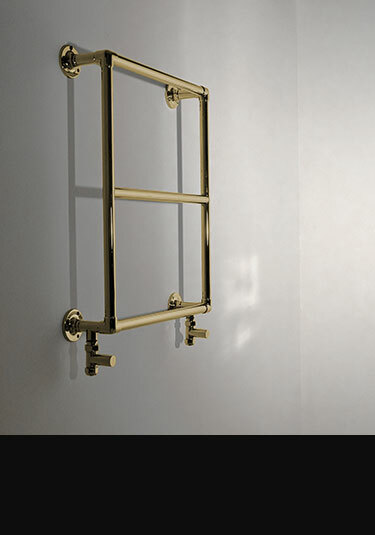 A superior British made gold heated towel rail that is designed for corner installation. This corner towel radiator is suitable for central heating, dual fuel and electric only systems and is made of superior brass tubing with a thick gold plated finish. This stylish heated gold towel rail is floor mounted in a contemporary design of an old Victorian style. Made in Britain to a very high standard and available for central heating, dual fuel and electric only systems. Luxury brass with a gold plated finish. 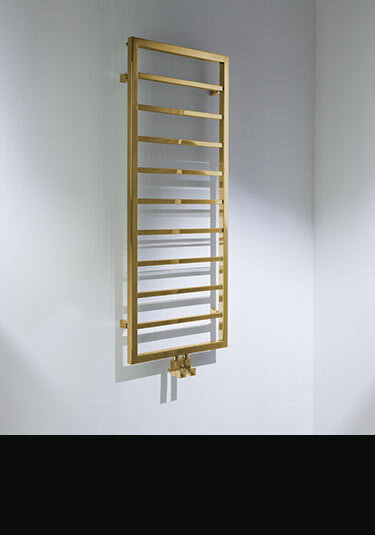 A beautiful British made gold towel radiator with lots of easy towel hanging space. 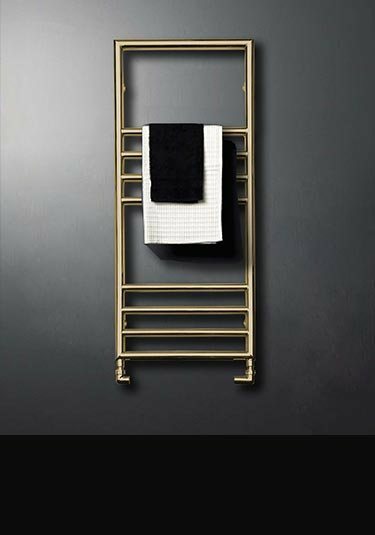 Each heated towel warmer has a thick gold plating onto solid brass tubing and is available for central heating and electric heating systems. 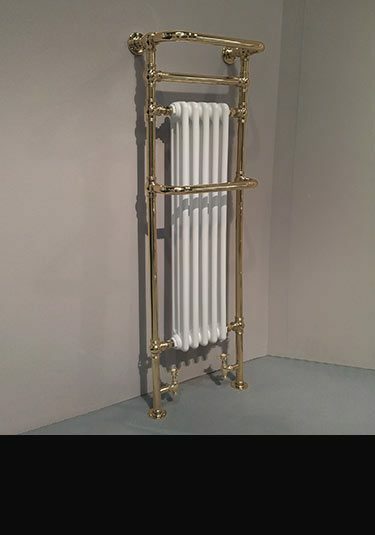 A modern version of an older traditional towel rail, this contemporary gold towel radiator is luxury quality and British manufactured. Available in for central heating, dual fuel and electric only systems.